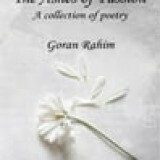 it is a good book with my best poems included. most of the poems are about a broken heart. a love relationship which don't exsist anymore. I hate when we complain about tears, as tears are the only true friend who wouldnt leave us when we are in pain.